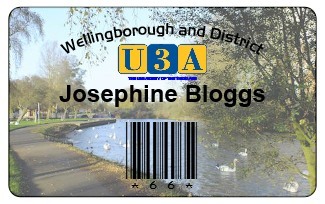 Welcome to The Wellingborough U3A website, if you are an existing member, thinking of joining or just browsing click on one of the above buttons for more information. Before you can join any of the groups you must be a member of the Wellingborough U3A, our annual membership fee is currently £12. U3A stands for the University of the Third Age. The U3A is an organisation for people who are no longer in full time employment. Membership relates to a period in one’s life (the Third Age) that follows the Second Age of full-time employment and/or parental responsibility. (The First Age is childhood). Anybody in their Third Age can join. There is no lower age limit for membership. The aim of the U3A is to provide educational, creative and leisure opportunities in a friendly environment. The local U3As across Britain are run entirely by the members on a voluntary basis. They provide opportunities for their members to share experiences through a wide range of interest groups. In each U3A these groups arise in accordance with the wishes of the members and depend on the skills and talents available within that U3A. Throughout the UK, many different interest groups are supported. These can range from the purely educational (e.g. Philosophy), through cultural (e.g. Art Appreciation), practical (e.g. Crafts), physical (e.g. Walking) to purely social (e.g. Scrabble). Those groups falling into the educational category adhere to the aim of LEARNING FOR PLEASURE. There are NO assessments or qualifications to be gained. The Wellingborough U3A was formed in 2004 and has gone from strength to strength with an ever increasing membership well over 700 at this time with approximately 70 diverse interest groups and new groups are always welcome. We have a meeting every month of the year, some social events but mainly guest speakers. This gives members a chance to get together with other members. If you are interested in joining our U3A please contact our membership secretary email, membership and please add your email, your phone number and your address. This will enable us to deal with your application quicker so you can be joining a great organisation. Please ensure you type your email address correctly. Below is a photo of our membership card, there is still some confusion about the card and membership renewal. So to clarify the position - this card is not replaced each year, this is your card to keep as long as you are a member of the Wellingborough U3A. It has your name on it so you can wear it, if you want, and people know who you are. Your Newsletter (In Touch) together with the latest Groups Insert can be viewed by members from the link on the side bar on the News page. To do this you need Adobe Reader. There is also a link to the latest National U3A events.